Far before Charles Darwin did the philosopher Friedrich Schelling (1775-1854) formulate his theory of nature that proposed nature as an endless operation. Man is part of nature, therefore his creativity is also part of natures productivity. It was a response to Fichtes cosmos of lifeless matter. 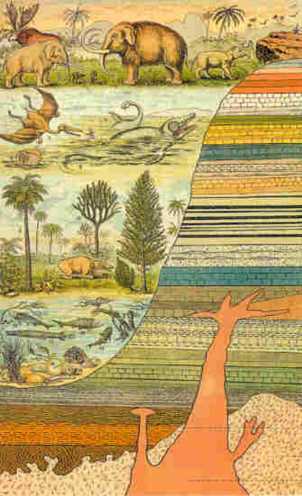 From this cosmos of permanent evolution the earliest ideas of former plants and animal life can be seen in this print of how gradually life evolved from the water below to the higher mammals at the top in relation to layers of earth. The fact that time and its cyclic nature is an intricate part of all religions and as such as a form of God is responsible for the creation or evolutionary conditioning of lifeforms was more or less neglected in this vision which was more the result of the realization of modern serial time that founded profane Christianity ever since the reform of Constantine in 325. That first christian emperor (just before his conversion) at the time introduced the commercial weekorder in disrespect of the natural cycles of the real moon and its reformed julian version of the roman fasti-calendar.